The QUEEN has arrived! From the creators of the original Supreme Slider™, we now have a supersized version! 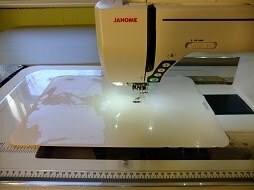 Perfect for quilters with bigger machines like the new Janome Horizon 6600 or Bernina 830. For smaller home machines that are set into a table, it completely covers all the surrounding cracks. Fabric slides easily in any direction. More than double the size of the original, the 100% Teflon® top slides with zero friction and has a pink self-sticking underside. The Supreme Slider™ "clings" and is easy to remove. Just three easy steps to successful machine quilting: 1. Attach the free-motion foot. 2. Lower the feed dogs. 3. Position the Supreme Slider™ on sewing bed with the needle centered in the pre-punched hole. Easy on, easy off! The Queen Supreme will fit into any machine with a 7" or larger harp (throat) space! National award-winning quilter Pat LaPierre developed this valuable tool so you can enjoy creating intricate marked or free-form designs. Noted authors and quilting teachers Diane Gaudynski, Sharon Schamber, Leah Day, and Joanie Zeier Poole give it "thumbs up!" The Slider™ is a GREAT tool for any machine quilter!!! ORIGINAL SUPREME SLIDER - 8 1/2" x 11" size is perfect for most home machines. KING SIZE SUPREME SLIDER - 16-1/2" x 22" size for large bed machines with 11" to 18" quilting space.